Home Mid-Summer Alignment on the Curragh? 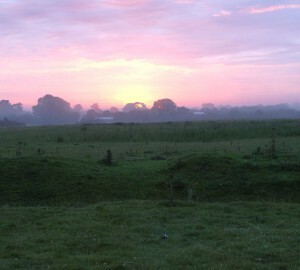 The Curragh of Kildare contains many barrows and other earthworks. Some of the largest and most prominent are situated on the Little Curragh. Excavations by Séan P. Ó Ríordáin in that area in 1944 would appear to indicate that the earthworks may have been used for ceremonial purposes. The largest barrow on the Little Curragh is “Raheenanairy”, which may be a corruption of Ráithín an Aodhaire – the Little Rath of the Shepherd(s?). This barrow was excavated by Ó Ríordáin who found “little to record in the matter of stratification or structural remains” other than some post holes. Raheenanairy, however, is situated on the crest of a ridge from where there is a clear line of sight to the hills and mountains surrounding the Liffey plain. I have often wondered if there was an astronomical alignment associated with the earthwork. The obvious, and warmest, alignment to investigate was sunrise on Mid-Summer Day. So on the morning of 21st June I set out to investigate. Unfortunately the weather was not conducive to solar observations and it was not until 23rd June that sunrise could be observed from the site. I was surprised to find that, when observed from the centre of the barrow, the rising sun lined up with a definite notch in the bank surrounding the barrow and there was a corresponding slight protrusion into the ditch from the inside lip. This notch had been noted by Ó Ríordáin, but he had dismissed it as a modern feature as it clearly was not an entrance, the ditch being continuous on the inside. It had not been excavated. The entrance to the barrow is on the west side. I photographed the “alignment”. Unfortunately the sun’s disk on the horizon was somewhat obscured by a tree, but I think the alignment is clear enough. Coincidence?